We are no longer accepting the following items: books, magazines, VHS tapes, audiotapes, vinyl records, TVs, or older electronic items like VCRs, computers, phones, etc. PLEASE PRICE YOUR ITEMS. We need volunteers, please! Call 349-2082 if you have questions. AmazonSmile is a simple and automatic way for you to support the Nelson County Humane Society every time you shop, at no cost to you. When you shop at smile.amazon.com, you’ll find the exact same convenient shopping experience as Amazon.com, with the added bonus that Amazon will donate a portion of the purchase price to us. To shop at AmazonSmile simply go to smile.amazon.com from the web browser on your computer or mobile device. On your first visit, select “Humane Society of Nelson County Inc” to receive donations from eligible purchases before you begin shopping. Amazon will remember your selection, and then every eligible purchase you make will result in a donation. Once registered, please enter our NPO number: BM191 to start earning rewards for the Humane Society! Please share with your friends and get the word out! Earn money for our shelter while walking your dog! Go to WoofTrax.com, download the app, choose Humane Society of Nelson County and start walking. It’s that easy. If you have ideas for fundraising or would like to help with any events or ongoing activities, please contact us at humane-societync@att.net or 502-349-2082, ext 201. Earn money for our shelter while walking your dog! 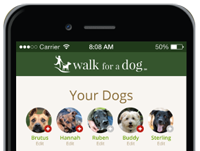 Go to WoofTrax.com, download the app, and support us every time you walk your dog.